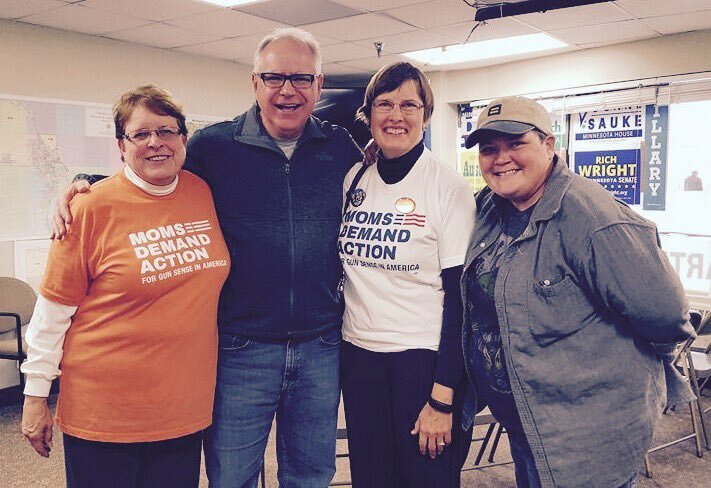 When last we spoke about MNCD1 DFL representative Tim Walz, he was cuddling up – literally – with “Protect” MInnesota’s ELCA-coiffed Dreamsicles. I urged gun owners in CD1 to remember this photo – the photo of “gun grabber Tim”. And this next bit should help? What “we’re doing” has lowered violent gun crime and gun murders 50% in the past 20 years. The “facts” do lie, when they are nothing but correlation leading to a false claim of causation; neither mass shootings or cops being shot are in any way effected by background checks of any kind (criminals don’t take them! ), and if he thinks suicide would be prevented by background checks, he’s clearly figuring cops will become clairvoyant. 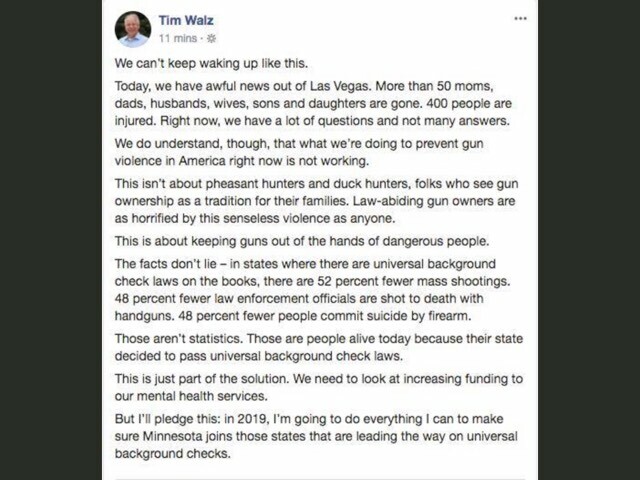 So facts may not lie – but Walz is. But that’s the line; he’s going to “do everything” he can to foist a law on the people that can not affect crime, and can only serve to register the gun of the law-abiding citizen. He is, of course, playing for the Metrocrat vote, trying to get the DFL endorsement to run for governor. He will promptly reverse course if he gets the nod (or runs for Congress again). The media will let this fall down the memory hole. This entry was posted in MNDFL, Victim Disarmament and tagged MN CD1 by Mitch Berg. Bookmark the permalink. No white papers on what they want. No media training for any of these “leaders”. They sound like morons. All vague all the time, every incident, every election cycle. Bloomberg’s money is a 100% a political power grab and they don’t give a damn if what they do after that makes sense or works. I am glad he mentioned the mental health aspect, though. These people doing the shooting are clearly off the rails. Maybe it’s not apparent to folks around them; surely thats the case in some of rhese incidents. A public info project on detecting the symptoms of a dangerous mental health crisis would be helpful. Also, the Daily Mail has published photos purported to be interior shots of Paddock’s room, including one of a body. If these photos are legit, several DDM4 rifles with bump stocks appear to have been used, but I still believe at least one genuine machine gun was involved. Not what Walz said in his earlier campaigns. It’s like he’s a political whore or something. They usually respond like Emery — they refuse to answer the questions and try more emotional appeals to “common sense” rather than thinking through the problem. And I keep bringing them back to the crux of the problem and they refuse to deal with the problem, and upon pointing that out, they get huffy and emotional. Suits me. You don’t bring problems and proposed solutions to an engineer if you don’t expect him to try to analyze and critique them; that’s what we do. You should come to a design review sometime, but only if your ego can handle being manhandled. Then, my colleagues and I at FiveThirtyEight spent three months analyzing all 33,000 lives ended by guns each year in the United States, and I wound up frustrated in a whole new way. We looked at what interventions might have saved those people, and the case for the policies I’d lobbied for crumbled when I examined the evidence. The best ideas left standing were narrowly tailored interventions to protect subtypes of potential victims, not broad attempts to limit the lethality of guns. This is obvious. The NRA & gun owners don’t oppose “common-sense” gun control measures because they are stupid and/or evil, they opposie gun control measures that empower the state over the individual to serve no good end. Ms. Libresco should carry her research further and examine why, if so called common-sense gun control measures are clearly ineffective, liberals and Democrats support them. The answer is hatred and a keen desire to oppress the people that are hated. Why “lives ended?” The problem with counting homicide is that each data point requires someone to actually die. The difference between an attempted homicide and a homicide is often the speed of first responders and the quality of emergency room. How do we know that is not what we are measuring? The Brady Center was just on Fox News. She didn’t articulate anything. Happens every single time. The American Left in 2017 has devolved into an umbrella group for church ladies. Greg, the “lives ended” phrase is a code to hide the fact they’re blending homicide and suicide committed with a firearm. That’s important to know, because if you want to ban guns, you count every death connected to guns in order to pump up the numbers to make it look like a crisis that demands immediate knee-jerk reaction. Similarly, they count people up to age 24 as “children” to make those numbers seem worse. On the other hand, if you honestly want to reduce deaths by gunfire, you look at motivation rather than tool. The motivation for Gangster A to shoot Gangster B with a gun is different from the motivation for Sad Old Man to shoot himself with his own gun. The solution to the first “ended life” is stop-and-frisk whereas the solution to the second is mental health treatment. About this time, the typical Liberal loses interest because analysis requires application of intellect and that’s hard work, when all she wants is to inform you how virtuous she is, because she cares so much. One trick I’ve seen to count “violent gun deaths” which implies homicide, but includes suicides. IIRC, there are about 2 suicides for every 1 homicide with a firearm. JD : “Greg, the “lives ended” phrase is a code to hide the fact they’re blending homicide and suicide committed with a firearm. “Greg, the “lives ended” phrase is a code to hide the fact they’re blending homicide and suicide committed with a firearm. Sure, but putting aside the “for public consumption” factor, we see academics and experts arguing for and against the efficacy of various policies based on homicides. Yet these numbers are nothing more than a fog of statistics which fail to control for things like the effectiveness of medical services and the style of violence. We can only count the bodies that we find and never count as a homicide the guy who was shot eight times in the chest and abdomen, yet lived. So yes, counting homicides is a purely emotional and propagandist thing to do – and that was my point. I’m not the hardest-core right-wing kook in my little circle of acquaintances. One suggested a temporary ban on medical treatment for gunshot victims in Chicago might ‘thin the herd’ and reduce recidivism. Wouldn’t have heard that kind of talk a few years ago. What accounts for people on The Right hardening their hearts? I suspect the result of the endless water torture of Left-wing lies and lectures is not capitulation, but exasperation.